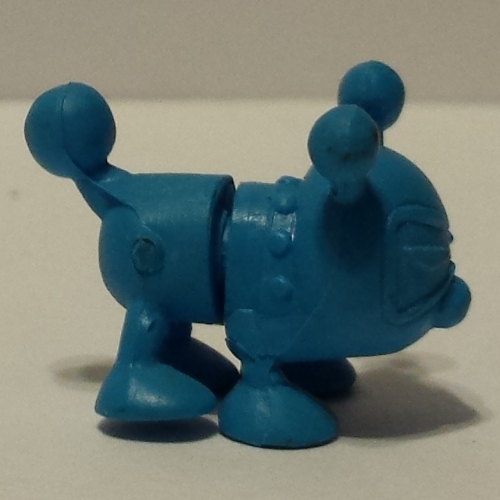 Today, I’m focusing on half of the keshi from the Super Bomberman 5 series. 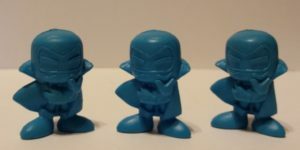 There were twenty keshi produced for this line in total, and at the time of this writing, they are among the rarest to find online. Before obtaining this set, I hadn’t even seen pictures of the majority of them. I currently only have eighteen of them, so for this article, I’ll showcase the half of my set that is more complete – the 8 Fiendish Bombers, Subordinate Bomber, and Terrorin. 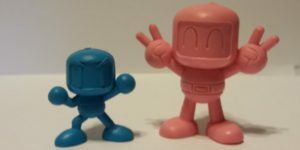 A Super Bomberman 5 keshi on the left, and a Super Bomberman 3 keshi on the right. It’s only the first entry, but it’s already a weird one. 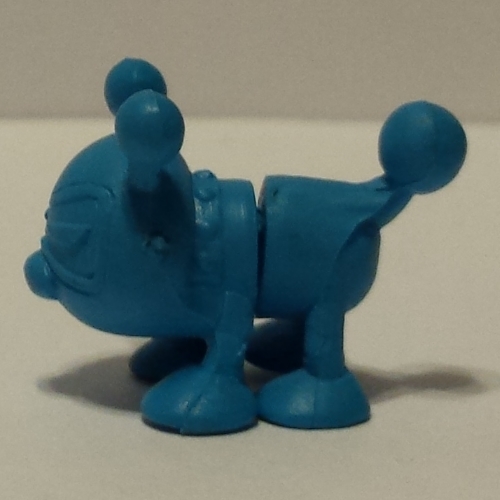 Bomber Woof (the pun in his name, “Bomberwan“, is unfortunately lost in translation) is the only figure in the whole set to have an attachment, and unlike characters from earlier sets, his attachment is… half of his body. His body splits in twain, is what I’m saying. 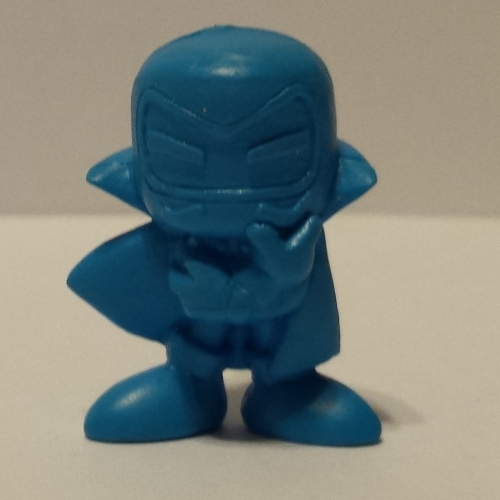 No, you can’t attach a cape to his torso. Not that I’ve tried. Because he is no bigger than any other character, I can only imagine that there was some manufacturing quandry that led to this decision, but I don’t know what it could be. My initial thought was that his base was larger than acceptable for the size of molds they were using. Given that some other characters seem somewhat flattened in depth, this does seem like a possible explanation, but I don’t understand enough about the production of these things to know. 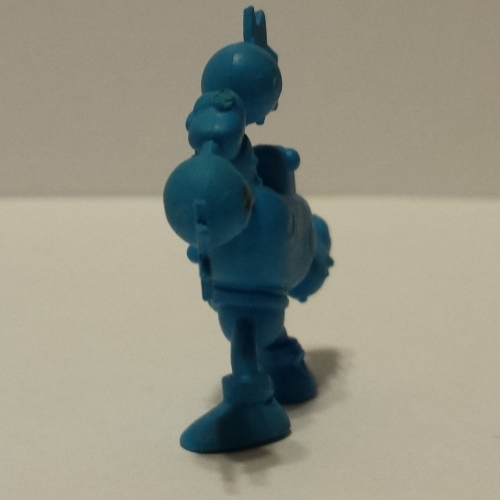 Now, about the figure himself… He’s cute from the front or back, but there are some oddities when you look at him from the sides. 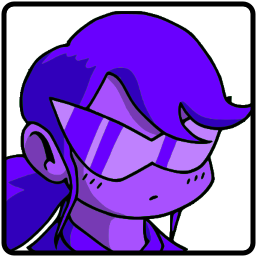 The back half of his head is flattened, and his face kind of melds into the rest of his body. 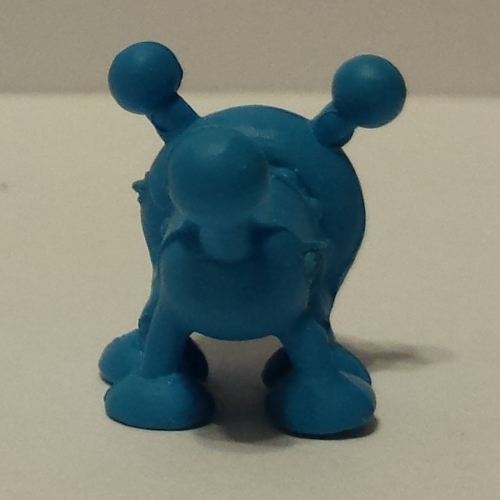 His tail similarly melds to his bottom along his mold lines. 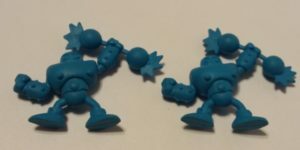 In general, the Super Bomberman 5 set doesn’t seem to have quite the same consistency as the larger sets, partially due to the smaller scale muddling the intricate details, partially due to the wide variety of body shapes in the characters (and the sculptor having to fit them all within the same size frame). It’s still a good set though. With all that behind us, a bonus point for Bomber Woof is that he doesn’t topple easily! 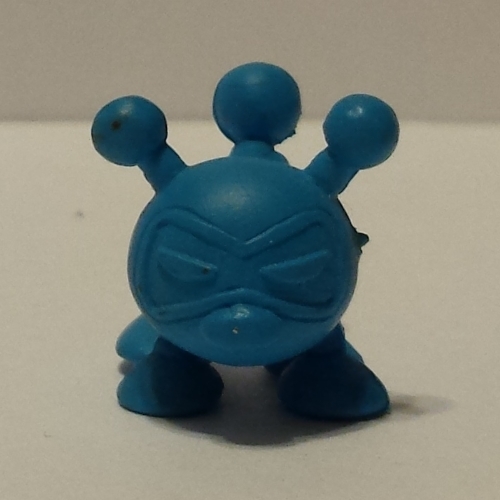 Baron Bombano is one of the first Super Bomberman 5 keshi I both saw and collected, alongside Plunder Bomber. For some reason, those two, as well as some of the normal Bombermen I won’t be showing this time, are the most common in online auctions. In fact, as a result of this, I now have three of him. 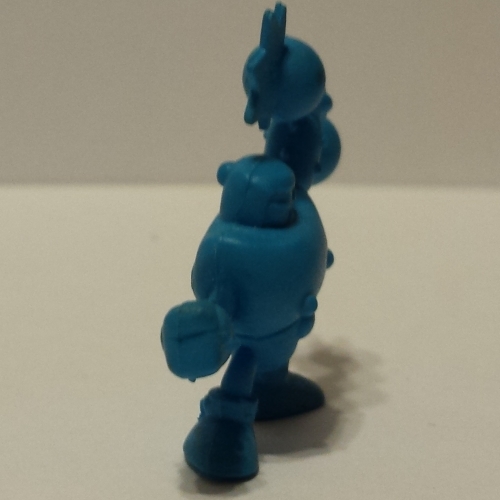 In my opinion, this is one of the more solid figures in this half of the set. 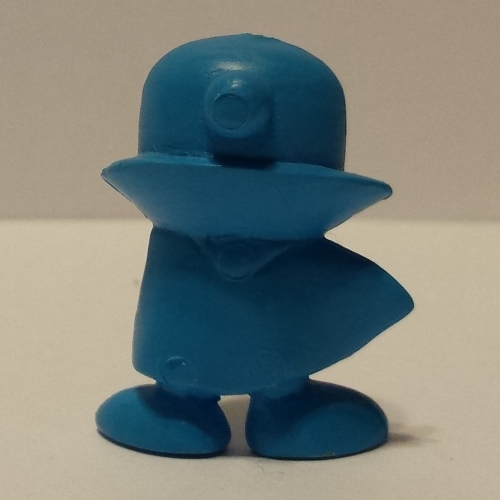 His pose is cool, he’s balanced, and he’s well-detailed. 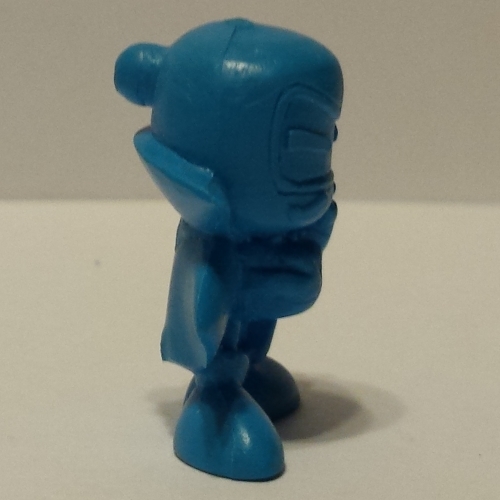 The only strange thing is that his head is a little flatter than the normal Bombermen, which is the case for many of the characters in this half of the set. 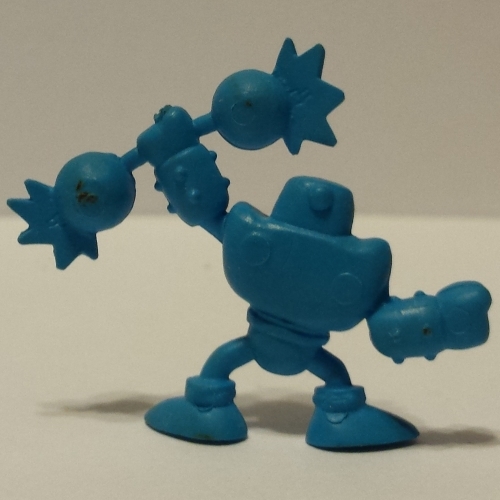 It’s interesting that the sculptor chose to include the bomb weight that Muscle Bomber carries in his artwork. It certainly makes him stand apart from the other figures. 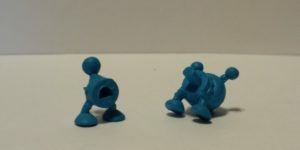 Given certain inconsistencies across the keshi sets, It seems like the sculptor or sculptors were only given game manual artwork to go by, so that might explain it. 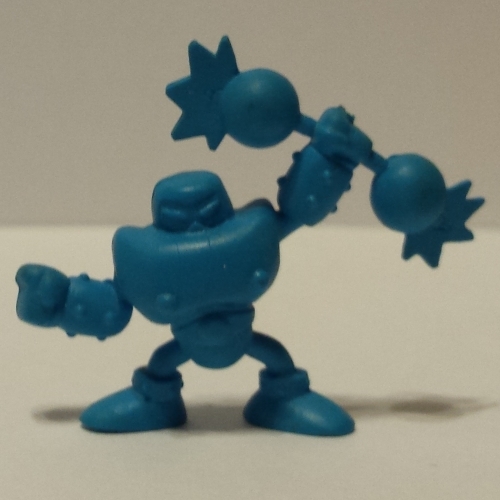 Of course, as a result of this and his sheer size, he’s scaled down a lot to fit in with the other keshi. This also makes his weight and his limbs really skinny and really fragile. I’m kind of afraid to handle this one too much. 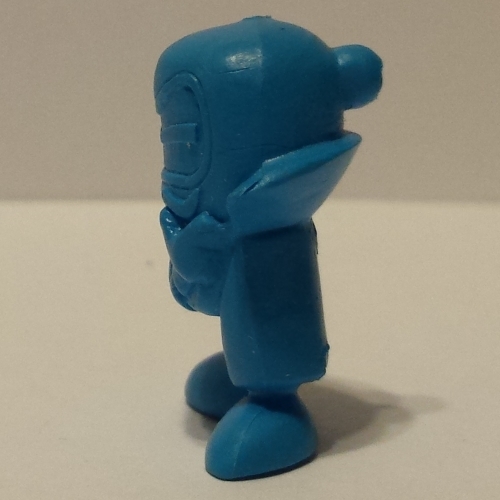 One of the copies I have won’t even stand properly because of the way one or both of his legs seem to have bent, possibly in his original packaging. The bar held by the one in the right even seems to be bent a bit. Despite those complaints, the attention to detail is spot on here.